We Welcome you to the website of Railway Recruitment Board, Bangalore. 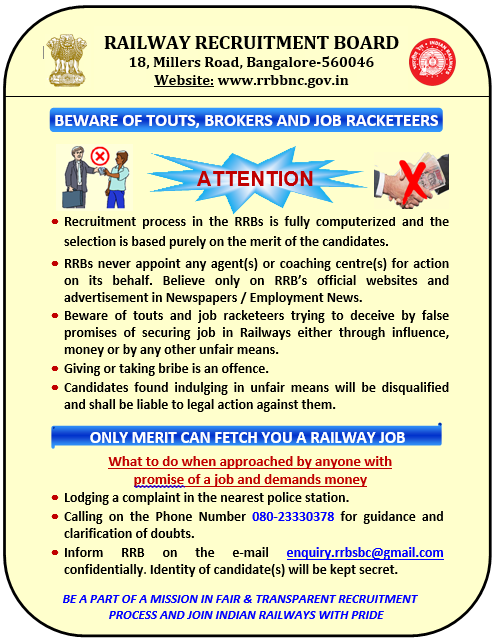 RRB selects candidates purely as per merit and hence the candidates are advised not to fall into the trap of any touts or job racketeers in connection with appointment in Railways. This website is dedicated to our candidates who are desirous to seek employment in INDIAN RAILWAYS through this Board. It is our effort to make up-to-date information available which a candidate wishes to know.